22p - HMS Gibraltar was an Edgar-class cruiser launched in 1892, made into a depot ship in 1912, and sold 1923. 54p - HMS Gibraltar was a 101-gun screw first-rate launched in 1860, on loan as a training ship in 1872, renamedGrampian in 1889, and sold 1899. 64p - HMS Gibraltar was the 80-gun Fénix captured at the battle of Cape St. Vincent in 1780, used as a powder hulkin 1813 and broken up in 1836. 70p - HMS Gibraltar was an American 14-gun brig captured in 1779, then in turn captured by the Spanish in 1781and renamed Salvador, then recaptured by HMS Anson in 1800. 80p - HMS Gibraltar was to have been a 45,000 ton aircraft carrier, ordered fr om Vickers Armstrong on 15September 1943, but cancelled in October 1945. £1 - HMS Gibraltar was a 20-gun sixth-rate built in 1711, rebuilt 1727, and sold 1748. It was the first command ofJohn Byng, who was aft erwards to be court-martialled and executed in the opening stages of the Seven Years’ War. 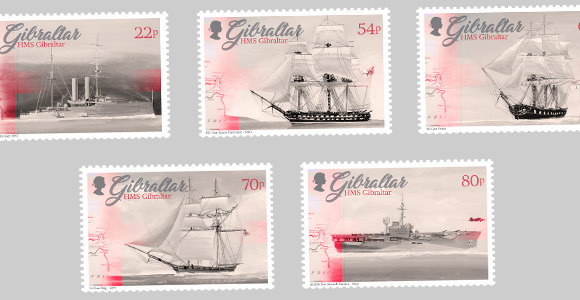 £3 - HMS Gibraltar was a 20-gun sixth-rate in service fr om 1754 to 1773.